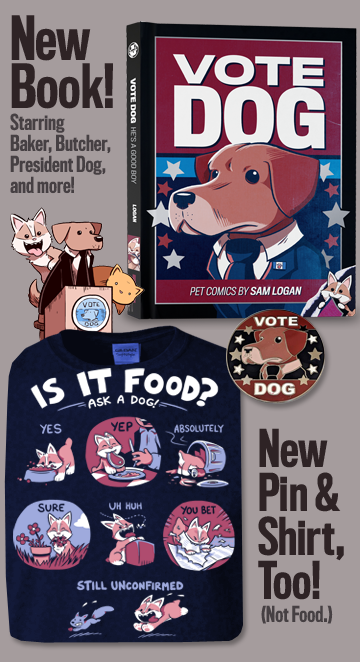 Topatoco will be peddling both the new book, and the tanuki t-shirt, plus a variety of other Sam and Fuzzy swag. And you'll also find me there, hiding from the crowd, doing sketches and commissions, and possibly destroying Ryan North at New Super Mario Bros. It will be the best, friend. Anyhow, I'd best go mentally prepare myself for the madness that is SDCC. See you there, con-goers! It's that time again! San Diego Comic-Con: North America's biggest, craziest, longest, most exhausting, and most outrageous show for movies, games, toys, and other geek pop culture. (And they have some comics in there, too.) I will be there all four days, and preview night, at the Topatoco booth! You can click the image to see it on a map... one that only shows half of the ridiculously enormous show floor. Whew! Among other things, Topatoco will have our two newest items at the booth... the new book, and the tanuki t-shirt. And they'll also have me, doing sketches and commissions and generally causing trouble. If you're going to be at the show, come visit me and my friends! You will not regret it. All right! I'd better get back to packing. See you in San Diego, Comic-Con people! New book! New shirt! Holy smokes! So, did anything interesting happen between Wednesday's update and today's? YES. In case you didn't see... the brand new Sam and Fuzzy Are Very Famous book collection is now on sale, as is a brand new shirt. You can order them online, or pick them up at next week's San Diego Comic Con! Either way, It is an exciting time to be alive. I am so happy with how these turned out. 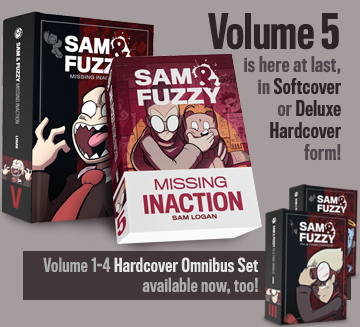 If you're a fan Sam and Fuzzy, then trust me... these books are the optimal way to consume it. They're gigantic (400 pages! ), they're gorgeous, and they help put food on my table and pens in my hand. And if they do well, we can make even more books and eventually collect the entire archive... my greatest dream! In conclusion... new stuff! I hope you like it. I do my best!